How come themes aren't working properly? GIMP Forums / GIMP / General / How come themes aren't working properly? I tried adding themes to Gimp, and it's working properly, but I keep having a problem and its irking my nerves. I screened this image off a website that offers themes. I tried using other themes too, but the problem persists. Is there anything I can do so that the menu bar looks like the first image? RE: How come themes aren't working properly? One problem is, many (most) of those are only partial, they build on what is already there. Sometimes you can 'tweak' them and substitute your own colour/font values. 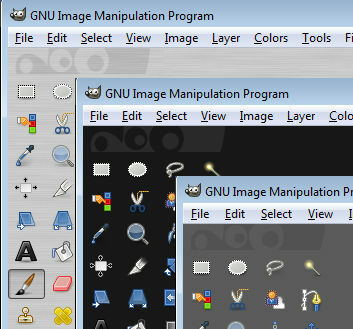 Another problem is using a Gimp 2.6 theme with Gimp 2.8. Not a good idea. First thing to try, is change your over-all Windows theme (maybe lose the aero temporarily) and see if the new Gimp theme works. Then you have narrowed the problem down a little. (May 28, 2014 07:58)rich2005 Wrote: Windoze OS ? My OS is windows 7, sorry I forgot to mention. I tried running the program with aero disabled, yet it still kept happening. Even with themes compatible with 2.8, I still have the issue. EDIT: Also, yes, that's where I got the themes from. (May 28, 2014 08:17)paynekj Wrote: Which theme is it you are having problems with? As Rich says, I've found a few that don't work completely on Windows but not normally on the menubar. Well I've tried a few themes, the one in the screenshot is ClearlooksDarkOrange. Others I've tried are Industrial Charcoal Theme and T-ish Brushed Metal Aqua Theme. I know I said I tried this without aero and for some reason the menu bar was still affected, but I tried it again and I'm not having the problem anymore. The menu bar is unchanged, so I guess I'll just have to work without it. A few of the programs I use often can't work with it on, so it's best if I leave it off now too. Thanks for your help.